Eleven year-old Ethan Allen Doyle has witnessed a brutal murder and now the boy is running for his life. In the time-tested tradition of Southern Fiction, Crosby unveils the darkest side of human nature and then rewards her readers with a beautiful tale of love, loss and unexpected gifts. 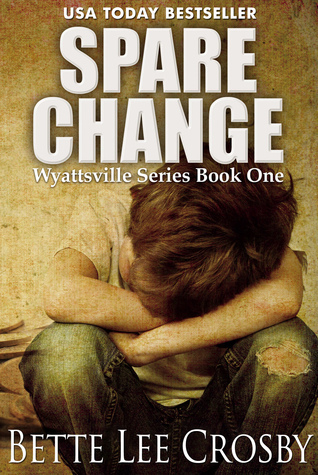 Spare Change is the first book in the Wyattsville books by Bette Lee Crosby. I found it a little different and delightful. I loved the main characters, and disliked others. Olivia is a woman who never wanted to be loaded down with children, so she has worked all her life, remained single and forever been grateful that she has not been burdened by a family clinging to her skirts. She is also very superstitious about the number eleven. When she meets Charlie at the age of fifty eight she is head over heels in love and marries. When Charlie dies she mourns for weeks then returns to his apartment in Wyattsville and with the help of her neighbours in the building starts to live again. I loved the neighbours, truly a formidable group. Ethan Allen has seen too much in his young life, the victim of circumstance and others evil ways. He's tough and resilient and when he is faced with a terrible situation he goes in search of his grandfather. When he arrives finally he only meets up with Olivia and so begins their relationship. It is a little disconcerting for Olivia of course that Ethan is aged eleven! It is this part of the book that warmed my heart as Olivia and Ethan gradually bond. Many of their moments together were filled with humour, that I loved about this book. However Ethan Allen and Olivia have one final battle to fight and a little surprise at the end. I loved the epilogue that shows Ethan Allen with a family of his own, and then Olivia's final revelation. This book was a mixture of horror, loss, and love. It was heart warming and funny too. I liked the way the author told the story from various points of view - it worked so well and I enjoyed seeing events from various characters standpoint. A special mention to Jack Mahoney - another character whose wisdom and the way he did his job touched me. This sounds like a good book. I enjoyed your review. The book cover is also compelling. Pat the book was very good. The cover does capture the plight of Ethan Allen well. I'm really intrigued by this one. I would love to give it a try! I wasn't sure either, but once I got into it, I was hooked. My niece would love to read this book!